Comments: When the War Between the States broke out in April 1861, Andrew Mahoney was a 35-year old carpenter for the James River and Kanawha Canal and the father of five children under the age of eleven. 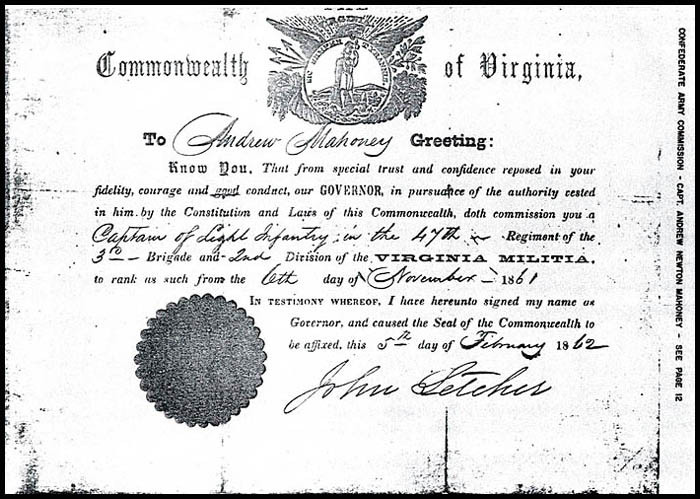 Andrew enrolled for active service on April 17th as a Sergeant in Company C (Scottsville Guard), 19th Virginia Infantry. On November 6, 1861, Sergeant Mahoney was elected Captain of Company C by a vote of the company to fill a vacancy occasioned by the resignation of Captain Albert W. Gantt. The election was superintended by Lieutenant Colonel Strange, commanding officer of the 19th Virginia Infantry. Captain Mahoney served in that capacity until April 28, 1862, when he was not reelected Captain and retired. He later appeared on the roll of POWs paroled at Columbia, Virginia. 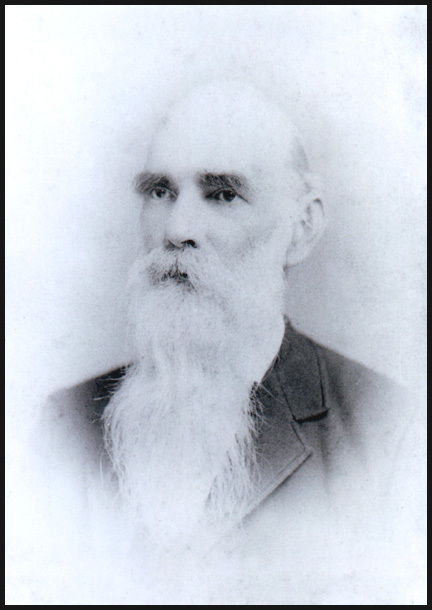 Andrew was born in 1825 at Old Point Comfort, Virgina, and was the son of Benjamin Mahoney, and his wife, Teresa Newton. On July 12, 1849, Andrew married Mary Catherine Everett, in Richmond, VA. By 1860, Andrew and Mary Catherine lived in Scottsville, Virginia, where Andrew worked as a Canal carpenter and lock master. When Andrew joined the Confederacy in 1861, Mary Catherine did the best she could to raise their five small children in the absence of the family's primary breadwinner. They lived on Jackson Street (Lot 32) in Scottsville, and young Andrew Newton, her son, recalled one day when a black man came to their back door and asked for a tiny piece of corn pone only "about the size of my hand." Andrew said that hand looked as big as a shovel to him, and he was sure there wasn't that much for the whole Mahoney family. Mary Catherine's family responsibilities were heavy, and she missed Andrew dearly. Her grandson, Edwin, said his grandmother cried so much while her husband was away during the war that she broke a tear valve. Thenceforth, a constant tear trickled down her face, and she would stop occasionally to capture tears in a small vial. Perhaps she was saving them until Captain Mahoney returned home. In March 1865, General Phillip Sheridan's men occupied Scottsville, and Andrew Newton Mahoney vividly remembered the Union soldiers setting fire to the woolen mill and watching it burn to the ground. Although the Mahoneys and other Scottsville families could have used some of the woolen materials, they were not allowed to do so and could only stand by and watch the mill go up in flames. Andrew Newton also remembered going to the Union camp with his brothers and trading corn bread for hardtack with the soldiers. The Mahoney boys were tired of corn bread, and as the Union soldiers were tired of hardtack, it was considered an even exchange. Captain Andrew Mahoney, an old and respected citizen of Manchester, died at his residence, corner of Eighth and Semmes streets, after a long illness in the sixty-eighth year of his age. He was a gallant soldier, and served through the war as captain of Company C, Nineteeth Virginia regiment. He was connected for many years as a master carpenter for the James River and Kanawha Canal Company and afterwards with the Richmond and Alleghany Railroad Company. He then took charge of the Manchester Water Works, and continued in this position until forced by ill health to retire from business. He was noted for his kindly and charitable impulses. His funeral will take place from St. Peter's Cathedral at 10 o'clock this morning. The 1890 photo of Andrew Mahoney is part of the Pat Windschitl collection. Ms. Windschitl resides in Virginia Beach, VA, and is a great granddaughter of Captain Mahoney. Agnes Donnelly also contributed her primary research on Captain Mahoney's Civil War service and Scottsville life. Included in her collection at the museum are several 1977 letters, written by Edwin C. and Harry L. Mahoney to record the Civil War memories of their father, Andrew Newton Mahoney. Included in Mrs. Donnelly's research were copies of Andrew Mahoney's Civil War records from the National Archives, Washington, DC. Mrs. Donnelly lives in Penn Laird, Virginia, and is also a great granddaughter of Captain Mahoney.